So you might think all the new year new number navel gazing was behind us. It isn’t. I just reread CC Chapman’s awesome book Amazing things will Happen, and I decided to do something for me. In his Book CC talks about picking three main words and making them the hallmark for your year. I had done the exercise during December listing all the goals I had for my family and for myself. I distilled the goals into three main themes, and I wrote down the words. I also started a new sketchbook. I start a new sketchbook every year. And while I might not finish adding to the sketchbook that year. Still working on covering the blank pages from 2011 with beautiful and awesome stuff. But in 2013 I left three pages blank before moving forward. I wrote my words and I promised myself as a show of commitment I would sketch out those three concepts, on those three pages. I’m terrified of the blank page. I’m always afraid of messing up the simplicity, with an errant pen stroke or a less than awesome idea. So i wrote my three words on the first page. Skipped three pages and dedicated each page to a concept. I hadn’t stopped to smell the roses yet this year. So I finally finished the three words. Are these the best i can do? No, but is putting something on a page always a step in the right direction… YES. 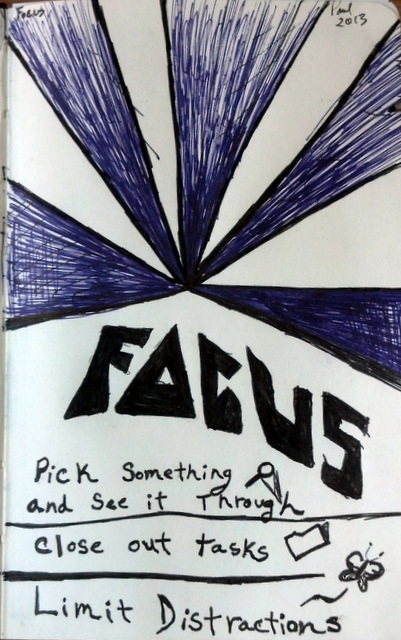 Focus: eliminate distracts, be they social media or otherwise. And concentrate on completing projects. No shortcuts. Close out the tasks at hand while resisting the urge to jump ahead of the list. 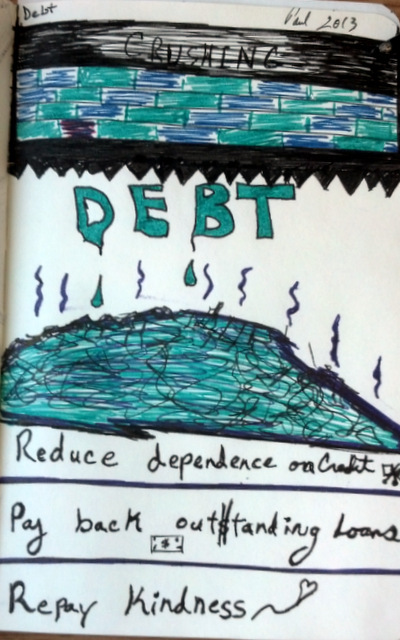 Debt: Both literal and figurative. I didn’t get here completely on my own, make sure to repay the kindness that others have shown you and be ever mindful of the ways in which my decisions affect my family’s goals. Basically try to operate a Zero sum gain. Don’t overreach my bounds, both in monetary circumstances and in time resources. 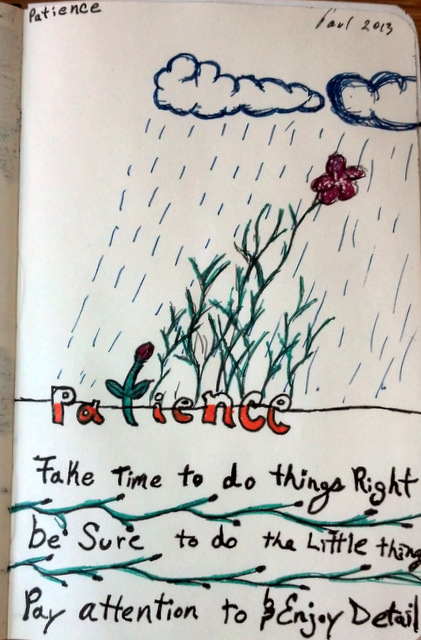 Patience: Not only learning to spell the word, but making sure that my focus isn’t wasted. By waiting for things to come to fruition before judging them. Also making sure that jobs are done right along the way. Patience also when interacting with my kids, to focus more on enjoying the ride and seeing what they see. I don’t feel bad about taking this long to get them done right. I should have thrown in Attitude too for an unofficial 4th. I need to focus more on the fun and positive side of things! 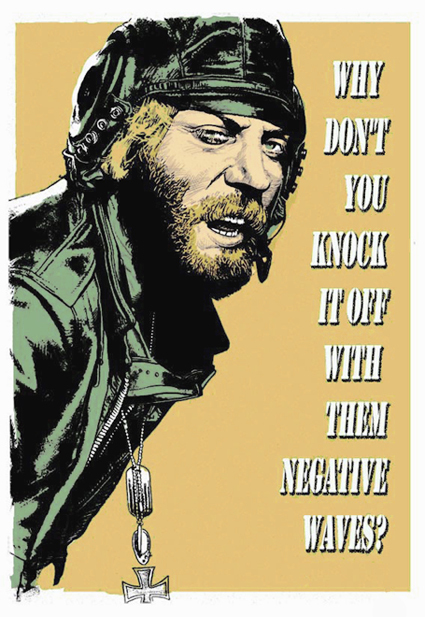 A line from one of my favorite movies Kelly’s Heroes!